In today’s story, was he taking his inner circle of Peter, James and John to share in that sacred experience as a means of consoling them after the difficult news he had just delivered? Matthew, Mark and Luke all tell this story as a part of a series of events that mark a turning point in their Gospels. Jesus asks his disciples: Who do you say that I am? Peter correctly names him as the Messiah, but Jesus tells them that he has come to suffer, be rejected and killed, and rise after three days. Then he adds that whoever wishes to come after him must deny himself, take up his cross and follow him. Throughout Mark’s Gospel, we see a strong focus on the failure of Jesus’ disciples to understand who he is and why he has come, despite the miracles he performed in their presence. How much was added to that confusion when he tried to explain that he had come to be a suffering Messiah? 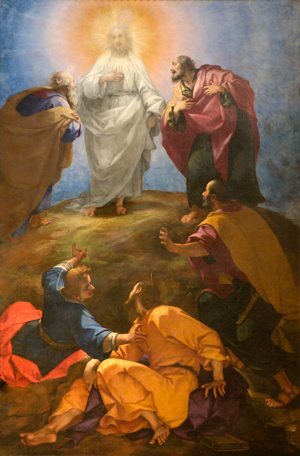 In the Transfiguration story, Jesus invites his key disciples into the hope that lies beyond the cross. As the glory that has always been and will always be his shone forth for them to see, there was yet another chance for them to acknowledge him as the Son of God and the one who came to bring fulfillment to the law and the prophets (Moses and Elijah). Yet, it would only be after his saving death that they would begin to understand his way and their way to glory would come through fully surrendering their lives out of love. All they needed was found in the simple command given by the Father: Listen to him. Every year on the Second Sunday of Lent, the Mother Church invites us to join Jesus in his pilgrimage up the holy mountain. As we come face-to-face with our selfishness and pride that has led us so often to sin, he invites us to reflect on his glory found through suffering. Can we put our lives more fully into his hands and admit that we need his help in conquering our sins? Can we understand that our glory, too, will be found in laying down our lives and putting on his ways of surrender, service, humility and gentleness? Can we linger just a moment on the holy mountain, tune out the voices that lead us astray and focus anew on only listening to God’s beloved Son? Let Lent be a time to do just that.